228 Episodes and Counting: We of course talk about a variety of gamer topics, mostly in the table top arena. Given our backgrounds we are heavy on D&D but we tend to try just about any game system or genre out there. Go back through the archives and there's bound to be a topic of interest to you. Actual Play/Role Play Dramas: This is our strongest feature. A lot of podcasts do actual play recorded sessions of their games, but @GamerstableEric and @Gamerstable_Dan take it up a notch with our game group. These dramas will astound you with their post-production, narration, sound effects and guest voice acting. We change to different games for each one, our last was Call of Cthulhu, and the next is Shadowrun. Check it out, you will find nothing like them anywhere else! Patrons and Fan Interaction: Gamerstable is very loyal to its listeners, providing extra perks and content to those who become patrons through the show or just following us daily on social media such as Twitter. 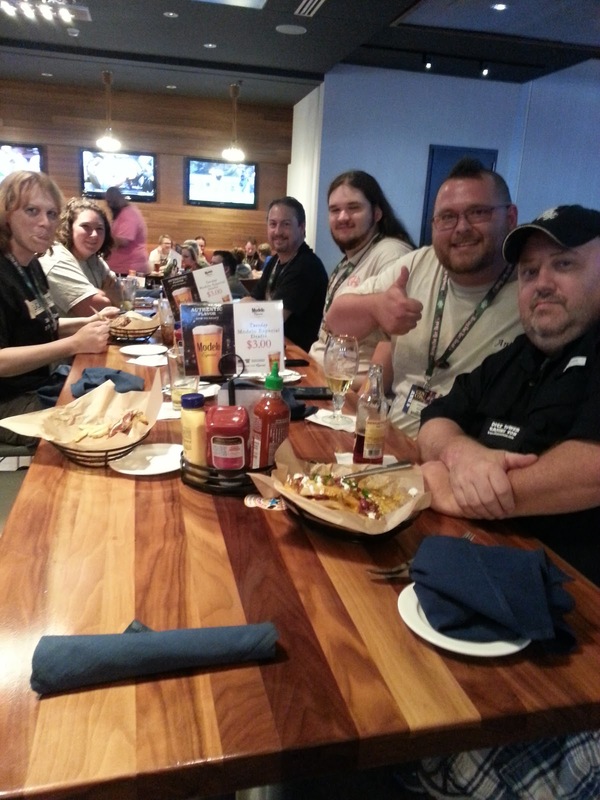 (I am @GamersTableMike) We have even met many of our listeners at GenCon each year and the gaming community grows more close because of it. That is not all! Browsing the site you'll find links to comics, short stories and links to our other projects such as the new podcast Titansgrave Diggers which follows Wil Wheaton's Titansgrave online show. 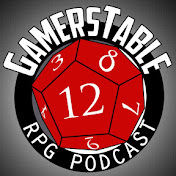 Join in on Gamerstable, drop us some comments or even recommend some topics if you feel inclined. Heck, I may even talk some Greyhawk who knows? Recently it was revealed that Zuggtmoy the Demon Queen of Fungi and former resident of the Temple of Elemental Evil, has moved on from her sometimes demigod lover, Iuz the Evil, to pursue a romantic union with Faerun's largest being, the fungal king Araumycos in the upcoming adventure Out of the Abyss. It's left to be seen whether Zuggtmoy returns Iuz's soul gem that she has kept in promise for so long. Neither Zuggtmoy nor Iuz could be reached for comment. The consensus on the streets of Greyhawk City is that the whole matter is silly, gross and probably not important to every day life on Oerth. Even so, with the wily Old One unattached and out of prison, the Flanaess' queens and princesses should be on guard. Welcome back Greyhawk readers! As usual I'm a week behind in promoting the newest page in the third chapter of our ongoing Castle Greyhawk graphic novel. Check out page twenty-three and follow some special narrative by astounding author Scott Casper. On our site you can also check the archives and follow the entire Castle Greyhawk story from the very beginning. Artist's Commentary:The party doesn't get much treasure so I can see why they're taking their time to get this wand. Tenser's look and manner is priceless in this. He is a good guy but has a definite greedy edge to him. Terik as usual is the guinea pig punching bag and does his job without complaint. I loved doing the first panel where he reaches out. Those type of panels are dynamic to look at. Now that this room is finished, it's time to move on to the next tunnel. Stay tuned! A sharp-eyed friend of mine, recently brought this interesting download on Scribd to my attention and it prompted me to do some digging around. The file is allegedly a 5E guide to the World of Greyhawk and was uploaded by one "Chris Perkins". Whether this is truly WotC Chris Perkins or just attributed to him is uncertain, but given his history with the setting I wouldn't be surprised. Don't get me wrong though, this is by no means a secret 5E Greyhawk document in the works. In fact, I don't see a shred of game material here, it's editionless information. The guide presented here is a well laid out, indexed mish-mash of Greyhawk sources and art from the "gold box" all the way to the Living Greyhawk Gazetteer. The use of a sans-serif font also evokes that old school D&D feel to this document. All in all it's a solid Greyhawk primer. One note, a perusal of the preview pages shows the section on festivals includes as far as I know a new town called Obsidian Bay. This place is where the homegrown nature of the document stands out. A simple search found a decent personal wiki devoted to a Greyhawk campaign centered on what I can only assume is the same Obsidian Bay. 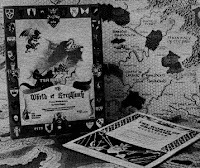 The wiki belongs to The Griffin's Crier a site devoted to the cool sounding Blackrazor Guild and their variety of RPG campaigns including yes, a 5E Greyhawk campaign. The Perkins confusion aside, if this guide does indeed belong to these guys I'd like to at least commend them for the effort. Wikis and personal campaign guides show a level of love for the setting that goes beyond the published works. It's a reason I belong to Canonfire and do this blog. If anyone from the Griffin's Crier reads this shoot me a reply and I'd be happy to talk some homemade hawk! Update 7/2/18: Chris, the author of this document is not the other Perkins guy, but is a big fan of Greyhawk anyway. Check out his reply in the comment section and his new site, Scruffy Grognard, HERE. From the Ashes, Greyhawk is Reborn! It is a dark and dire world where people have fled from the wilds, looking for the protection of fortified villages and walled towns. Travel is safe in numbers, yet still dangerous.Goblins, kobolds and their ilk fill the vast spaces between towns that are now bullied by hobgoblins, gnolls and orcs. People carry about their business by day, and lock themselves behind their defenses at night. The darkness becomes more dangerous each day; it's darker, more sinister, more evil. Rumors recently emerged of great fiends and other abyssal creatures now rule over weaker monsters. No, it's not a safe world anymore, not since The Breaking. It is just the kind of world where heroes are needed. Yet again explore one of the oldest, most beloved campaign worlds of all time. The world of Greyhawk will come alive again as your characters, your heroes, wander upon the Flanaess, pushing back the darkness. Create new player characters in your favorite world with classic races and classes. Create mighty warriors, powerful wizards, saintly clerics and dubious rogues. Your characters' actions will continue to shape the world of Oerth. Venture forth anew in the realm that brought you classics such as The Village of Hommlet, White Plume Mountain, Against the Giants, Slavers, and the Living Greyhawk Campaign. 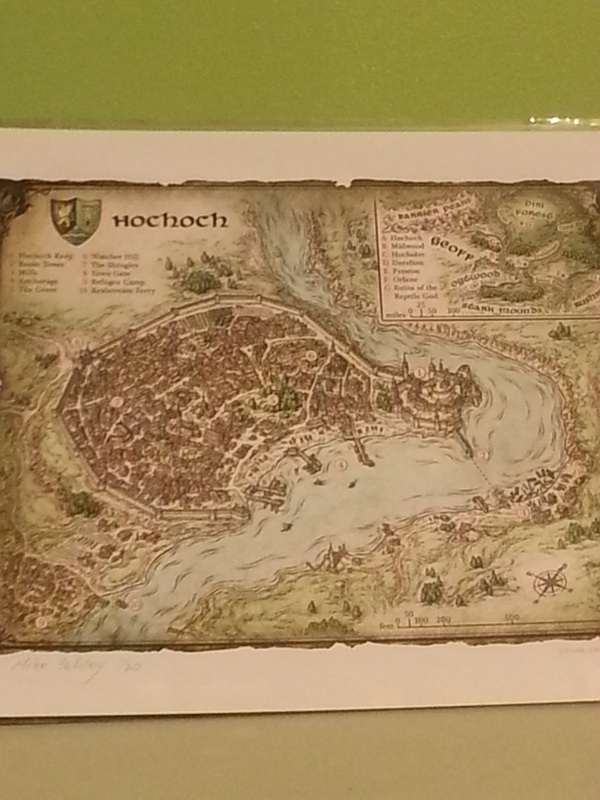 Revisit placers such as Saltmarsh, Greyhawk City, the Vast Swamp and the Amedio Jungle. Why Choose the Greyhawk Setting? The idea started with a home game we were doing in Keoland after Living Greyhawk ended. We had left Keoland rather fragmented. I know, I was the Keoland triad that left it there. A large part of "Breadbasket of the Sheldomar Valley" was destroyed (think Sherman's march to the sea). Not only were the existing crops wiped out, but it also ruined much of the arable land in Keoland. The land upon which the Army of the Returned marched is still barren and infertile 17 years after the fact. Many of the Keoish citizens in the way of the Army of the Returned were killed and reanimated as some form of undead. Many fine Keoish soldiers perished in the last battle against the Invasion in Niole Dra, as well. So even right after the victorious final battle, many citizens of the Empire were dead. With food destroyed and land barren, the starvation and widespread disease that usually follows such strife and crime ensued. The Flight of Fiends was a ruse by Iuz, who used the trick to aid him in his ascension to full godhood. With Iuz away from the Flanaess, and the Flight of Fiends a ruse, we pictured fiends being loosed upon the Flanaess, as well as the remains of both Iuz's army and the Army of the Returned let loose upon the lands. So, with little food available and disease, starvation and crime on the rise, it seems likely that those remaining would look for shelter in the protection of towns, villages and cities. Most villages and towns have been fortified with protective walls and other such devices. Add in the rapid proliferation with which humanoids breed, and it seems likely to us that orcs, goblins, gnolls, kobolds and the like would quickly fill the empty spaces in the countryside. That makes Keoland, and the Flanaess, once again a dangerous place outside city walls. Very much like it was in the Greyhawk of 1E, the famous "gold books", where populations of cities and countries was much smaller than the 3E Greyhawk Gazetteer numbers. We feel it gives it a very old school "Gygaxian" feel. Remember 4E's "points of light" mantra? I think GR nailed it. 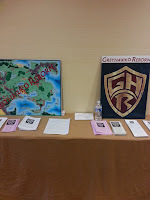 In later posts I'll talk about Greyhawk Reborn's call for fans to get involved. So yesterday at EN World, there was a post about an interview with WotC's Jeremy Crawford. The interview covered a lot of topics and many contain hints at where the near future of published Greyhawk might fall. All quotes below are Morrus' paraphrased responses by Mr. Crawford from the Tome Show interview found here. Let the speculation begin! "Other settings - "Nothing to announce right now." Other settings are all over the core books, with the multiverse emphasized as the official setting. 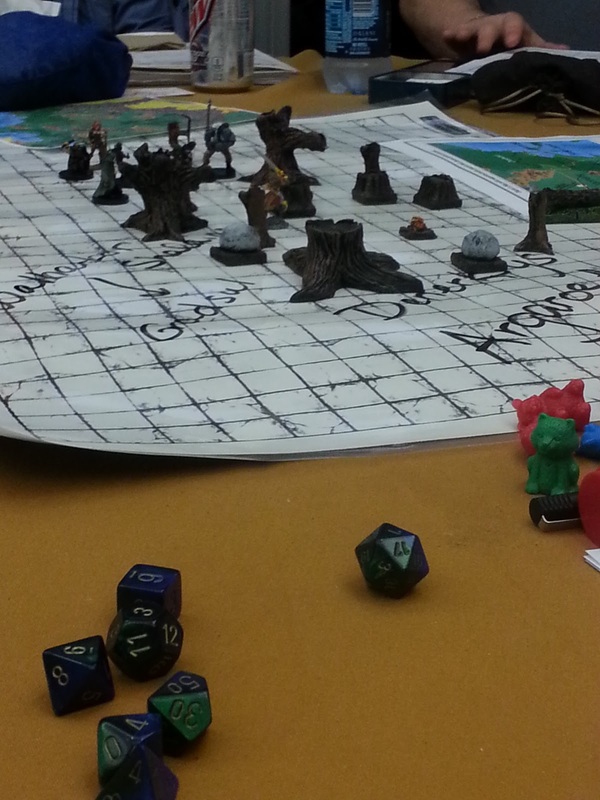 Forgotten Realms is the most popular setting, but other settings are part of the multiverse." Conveniently all settings are supported and not supported at the same time by this Multiverse tag. Not quite the same multiverse treatment we grew accustomed to during the heyday of 2nd Edition. Moving right along. "They are open to the idea of a new setting but the priority right now is serving classic settings and types of stories that can be told there. The Realms are large with room for many types of story." Serving classic settings, plural? Sure... If the right person came along and wanted to make a published homebrew D&D world and there was rabid fan interest, then yes, even the Forgotten Realms would be pushed aside momentarily. Could this happen? Of course it can, it just happened with Wil Wheaton's Titansgrave setting which sold out in the blink of an eye at GenCon. More on this later. 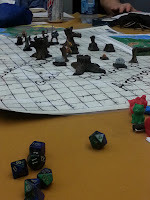 "Tiamat in Tyranny of Dragons failed with Krynn, and so tried again someplace else. It's not a Dragonlance story transplanted to the Realms, it's a multiverse story with villains which exist in some form or another in the entire multiverse. Princes of Elemental Evil bombed out in Greyhawk, so tried somewhere else. The demon lords don't just threaten one world, they threaten them all." "In some upcoming material, famous characters from other settings may show up under different names. It is canon that Elminster (FR), Mordenkainen (Greyhawk), and Dalamar (Dragonlance) know each other. This sort of thing will come more to the fore as one giant connected multiverse." Now this comment is an eye opener and a head-scratcher. So in a year or two their plan is to actually use the connected multiverse more, by way of The Wizard's Three type cameos or crossovers? That's wonderful then, except, doesn't it do a disservice to said settings like Greyhawk if their iconic NPCs are renamed? It's already been done before by Paizo when they renamed Tenser, "Manzorian" for their Dungeon Magazine AP Age of Worms. It makes no sense. Would Elminster take on a different name if he visited Dark Sun? In character he might, but the meta name would still be Elminster because they wouldn't want to diminish his iconic name. So Wizards, when it comes to Mordenkainen or Dalamar, don't be coy, please use them to their full glory! "Chris Perkins has needles and seeds which thread several years into the future, with seeds planted as early as Tyranny of Dragons which will take fruit later." This is another good sign for Greyhawk fans as Perkins is a big fan of the setting. Several years is still a long time to wait and see however. He could be gone by then or there could be a new edition, or a reboot. I really can't wait to see what Chris has in store. "They are not yet announcing what Pendleton Ward's project is." So there is the tip off for a new D&D setting. For those who don't watch cartoons religiously like me, Pendleton Ward is the creator of the popular cartoon Adventure Time. Ward and his writers/artists are heavily inspired by D&D. Just from his name being dropped I can gather WotC wants to take his star-power and make it the next Titansgrave. How well would that alliance do? 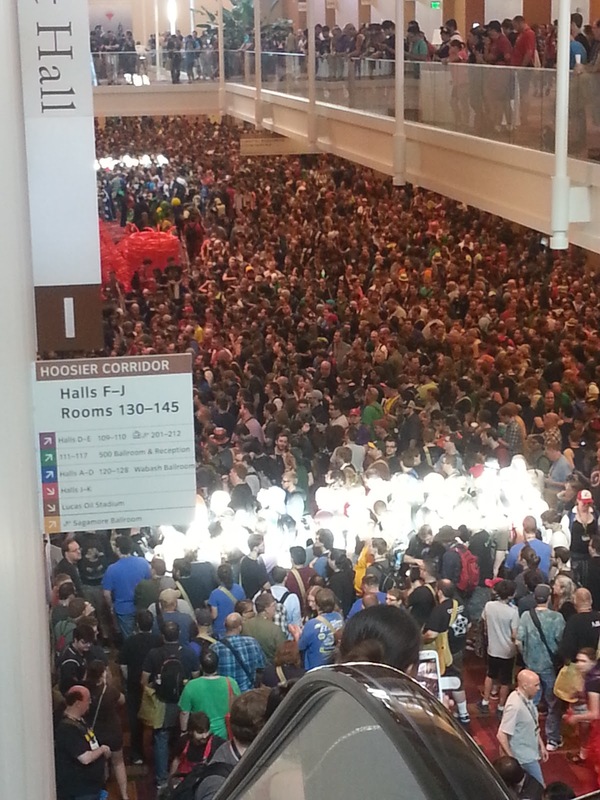 Well, I would stand in line at GenCon for an Adventure Time setting book and I'm a diehard Greyhawk fan! "On third party stuff, the familiarity with rules phase has occurred and they're waiting for the company to be ready to take the next step. "Nothing to announce at this point" though Crawford thinks there is a lot of value in having something like the OGL, both he and Mike Mearls worked on OGL products before coming to WotC. "Fingers crossed -we'll see what happens!" The OGL is where alot of Greyhawk fans are pinning their hope for short-term publication of new material. Considering the recent setting poll on the D&D website allegedly had fans voting Greyhawk as a second tier world behind several others that it normally trounces, I wouldn't hold my breath for a full Greyhawk treatment in-house at Wizards. Whether, one of their "collaborators" like Green Ronin or Kobold Press gets a chance is another thing entirely. There is definitely people among these companies I would trust with a daunting project like Greyhawk. Hello friends! 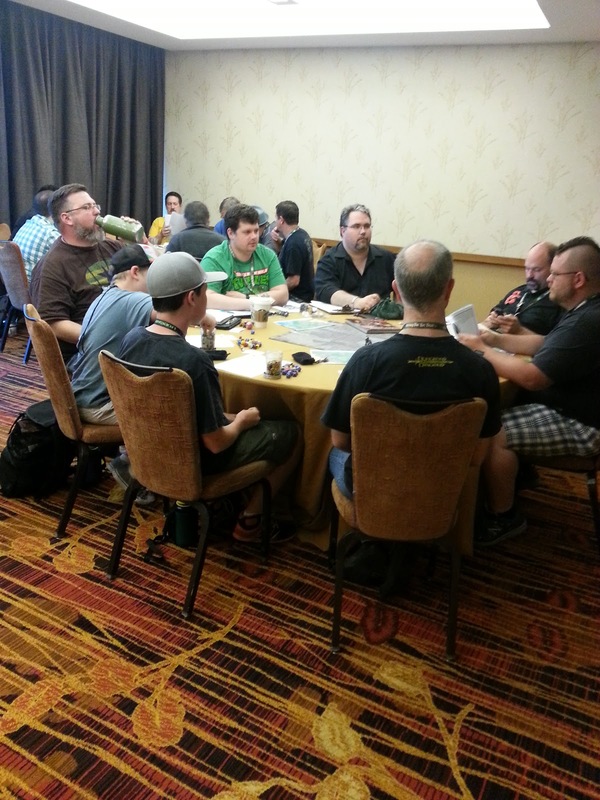 It's been a fun and exhausting week, so let's see what all transpired with the Greyhawk community at GenCon 2015. 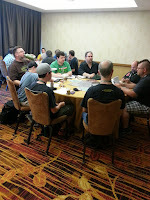 First the obvious, there was no new forthcoming news on Greyhawk, and as a matter of fact Mike Mearls has stated for future reference they will only make big announcements at other cons and leave GenCon for gaming. 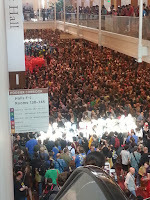 This year, though they dominated the Ennie Awards, they barely even had a booth presence. Fair enough. Now on to the fun stuff. 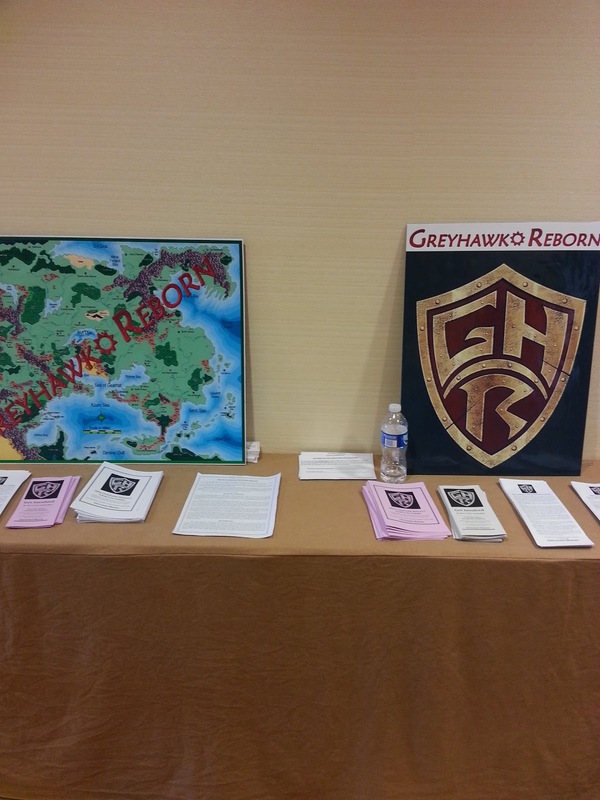 Greyhawk Reborn was a highlight of the last several years for me. 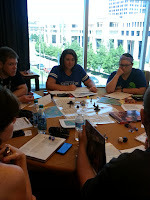 To see the spiritual heir of Living Greyhawk back at GenCon was a boost. Dave Guerrieri and his staff of writers and DMs was amazingly fun to chat and sit in on games each time I stopped by their room. 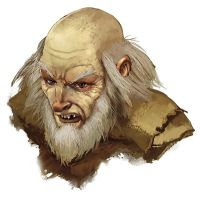 It was great to see that the bulk of the GHR crew is younger and relatively new to Greyhawk, but very invested in the lore and geography (their games are set in the Sheldomar valley and Hold of the Sea Princes). I especially enjoyed my long sit down with their mentor Dave, to discuss our gaming origins, the Greyhawk community overall, convention and home gaming, the state and usefulness of my parent site Canonfire and the possibilities of future Greyhawk publication in the event of a new OGL. 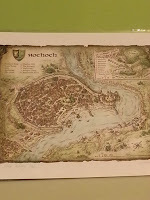 Dave's con experience is extensive and goes back to Living Greyhawk where he was in the triad that ran the very popular Sheldomar Valley region. With his knowledge, connections and ambition I can hardly think of anyone else right now that I'd want more behind a Greyhawk organized-play resurgence. How well did Greyhawk Reborn do? For only starting with a handful of tables and limited staff to work with their events sold out on registration day within the hour then when they added more those sold out too. Furthermore, on Saturday I learned that so many people lined up with generic tickets also wanting to play that Dave took it upon himself to run for many of them. Indeed just standing in the hall outside their room it was fun seeing people on their way to other games, stop to look at the map of Flanaess with a sense of wonder and nostalgia again. 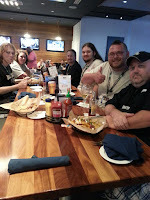 I hope Greyhawk Reborn can build upon this first GenCon and get more people to volunteer and expand their reach at this convention.